If you haven’t tried peppermint, you’ve been living on some other planet. This amazing herb is renowned throughout the world: it tastes and smells great, making it everyone’s favourite flavour of gum, a refreshing breath candy and a common herbal tea. Peppermint is a natural hybrid of two closely related species: watermint (Mentha aquatica) and spearmint (M. spicata). Like most hybrid species, it’s sterile, which means it does not generally produce seeds. But its roots spread vigorously, and it’s now found in the wild throughout North America and Europe. 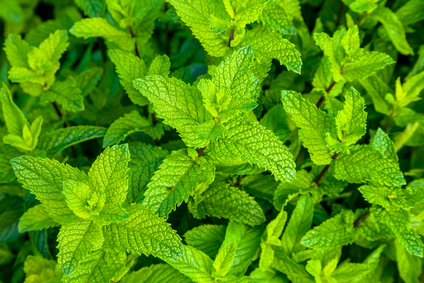 Peppermint is the richest source of menthol, the ingredient responsible for its characteristic smell and taste. Menthol has many medicinal uses: as an antispasmodic it inhibits smooth muscle contractions of the digestive system and relaxes the muscles of the esophageal sphincter. It also helps to release trapped air and reduces belching and bloating. In one study, 79% of those who took peppermint oil experienced less pain associated with abdominal gas. Further studies show that peppermint oil relieves irritable bowel syndrome (IBS), and a double-blind study found it was more powerful than the drug cisapride, which is intended for the same symptoms. Research shows that applying peppermint oil to the temples and forehead of a headache sufferer is just as effective as acetaminophen. It also helps to reduce symptoms of nausea when used as aromatherapy.